It was the buzz of the internet! A specific and often striking type of Deflector Shield, often made out of Pure Energy, that takes the form of geometric shapes that connect to form the overall shape — often hexagons, as they tessellate conveniently well. It's not mathematically possible to create a sphere-like shape from regular hexagons alone, but one can come close by throwing in a few pentagons (twelve, for a complete sphere), and some objects in the real world (like fullerene molecules and soccer balls) have such structures. Named after the hexagonal wax cells of honeycombs. In older games or computer animation, this may have been because an object composed of hexagons was much easier to convincingly render than a sphere; it now mainly owes its existence to Rule of Cool. A favorite of the Barrier Warrior. Another possible origin may be in the geometric-pattern visual hallucinations typical of drugs like mescaline. This design actually has a veneer of plausibility, since two-dimensional hexagons and pentagons can be used to enclose a three-dimensional volume without leaving cracks, and with excellent distribution of stress . Subtrope of Deflector Shields and High-Tech Hexagons. Despite the name, these shields almost never involve actual bees. IRIA: Zeiram the Animation overuses this kind of barrier for everything. Besides military use, it is excellent as an umbrella, a roof for your car, a window for your house, or as a prison cell. Finally, it can even be used for a weapon that can cut anything if it's activated so it intersects the target's body, while at the same time imprisoning it. The Photonic Research Institute in Mazinger Z uses a Beehive Barrier to protect the facility when under attack. And so did The Fortress of Science from Great Mazinger. Since Mazinkaiser is a reimagination of the original series, it includes this trope. And in the Shin Mazinger Zero manga, Minerva X used a Beehive Barrier to protect Kouji Kabuto and Mazinger Z. Neon Genesis Evangelion has them as AT fields: a series of hexagons originally located in a fractal shape but the Rebuild series has them either in an irregular formation or lots of layers sandwiched together (take a look at Zeruel, for example). 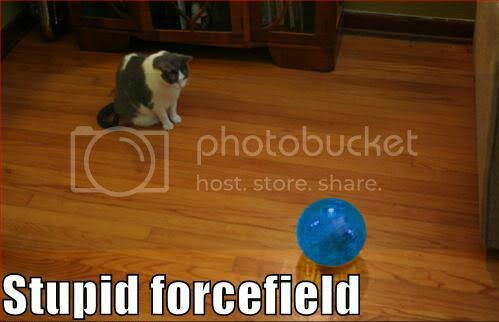 It is established knowledge that AT-fields are all but impenetrable and can only be brought down by either destroying the power source or using your own to partially cancel it out. Once it is weak enough, Evas can usually breach them (either literally tearing them apart like paper or, as Rebuild 2.0 show us, shatter it like glass). They can also be broken by excessive force (mostly the Positron Rifle) or the Lance of Longinus. One of the characters in Trinity Blood had a shield entirely too similar to Evangelion's AT fields to be anything but a deliberate homage. Used by Xellos in one early episode of Slayers NEXT. In fact it looked uncannily like an AT field, too. Rahxephon uses these as part of its shielding. In Zoids, buildings and certain Zoids were equipped with this. In Mai-HiME, Yukino's element takes the form of several hexagonal mirrors, which are used for defense. These show up whenever a barrier, literal or figurative, is called for in Sgt. Frog. Knowing the series, it could well be an extended parody/homage of Neon Genesis Evangelion. In Vandread, the Nirvana, Jura's Dread, Gascogne's service vehicle, and some others are surrounded by a Beehive Barrier — the only time we ever see a barrier that ISN'T of this form is when Jura's Vandread utilizes its planetary shield. The individual panels shrink and expand when under stress, too — adding a additional visual element. In Busou Renkin, whenever Captain Bravo is hit, hexagons appear to block attacks, as well as repair his jacket. In Code Geass, Lelouch's personal Knightmare frame, the Shinkirou, uses a nearly impenetrable defense field made out of hexagons. The barrier isn't a complete sphere, but the individual pieces can be manipulated in any fashion; however, doing so requires a very quick mind, playing to Lelouch's strengths. Phantom of M? uses a Beehive Barrier in the form of a flat wall, rather than a dome or bubble. Rarely used, but Vita's Deflector Shields do take this form during her first battle against a newly upgraded Nanoha in A's. Precia's energy shield is shown to consist of hexagonal bits when Arf, in response to Precia abusing Fate one too many times, flipped out and attacked her. The hedron shields of Heroic Age were a multipurpose psionic tool created by the Golden Tribe. In addition to functioning as a shield, it can also create Frickin' Laser Beams, repair and even create spaceships out of nothing, and create a region of livable atmosphere and temperature. In an episode of the anime, Ash and the others enter a beehive. One of the walls, a barrier between the heroes and Vespiquen, is made out of Combee. A LITERAL beehive barrier. In a later episode, the move Light Screen is depicted ◊ as a more usual version of this trope. The Devil Gundam can generate one in Mobile Fighter G Gundam, matching up with the hexagonal pattern of its DG Cells. The Lightwave Barrier in Mobile Suit Gundam SEED, as used by the asteroid fortress Artemis. Heartcatch Pretty Cure: Cure Sunshine's Sunflower Aegis is a Beehive Barrier shaped like a sunflower. Holds up just as well. In Bleach, Nanao creates a wall-shaped barrier after a smoother version is destroyed. However, this is actually said to make the barrier weaker, with the intention of baiting the enemy into a trap that is never seen because they see right through the ploy. The Mental Models of Arpeggio of Blue Steel can generate and use them as weapons. Guardian Angel in PS238 has one, as seen in this strip . Depending on the artist, Iron Man's shields can have a beehive pattern ◊. In Justice League: Doom, Hal Jordan creates a huge barrier of this shape to stall a solar flare. In The Cabin in the Woods, the protagonists are unaware that a beehive barrier force-field has been placed around the area to prevent any kind of escape. When Curt tries to jump the gorge on a motorbike, he finds this out the hard way. In The Hunger Games: Catching Fire the arena is enclosed by a beehive barrier force field. From the looks of it, the pterosaur aviary in Jurassic World. Guardians of the Galaxy to an extent. The convergence and interlocking of the Nova Corps in anticipation of air raid prevention. The Star Wars novels often describe Coruscant's planetary shield as two layers of hexagonal spheres, with missing hexagons allowing ships to enter and exit. In this case the hexagons were invisible, turning the visual trope into a tactical element: only authorized ships could safely navigate the shields and enter or leave the atmosphere. And in case of a battle, those openings would be normally be closed entirely, making it impossible for any lucky shot during an orbital bombardment to bypass the shields. This was also the justification for all the warships in Episode 3 being so close together. Of course, like everything else in Star Wars the real reason for that scene was Rule of Cool. In Star Trek: The Next Generation, Q and the Q-net ◊ are borderline examples, since they resemble square-ish... spheres? In the Star Trek episode "The Tholian Web", the Tholians are making a spherical geometric web thing to trap the Enterprise. In this case, the barrier is to keep the Enterprise in. Star Trek: Enterprise demonstrates a complete barrier: it not only blocks outbound attacks, but crushes the trapped ship. They also demonstrate a flat barrier they use to barricade a space dock, but that is rather easily defeated. The Tortoise Fist user Maka in Engine Sentai Go-onger vs Juken Sentai Gekiranger uses this kind of shield, patterned after a tortoise shell. In The Gifted, Laurens power is something she described as pushing things together, able to use whatever material is around to make what pretty much amounts to force fields, such as her usual technique of condensing the air around her until its as hard as a wall. When she uses it to its maximum, it looks like a dome or wall of translucent hexagons. In End of Nations, the Patriot class can use the hexagon-layered Asgardian Dome Support Power to protect affected units from all attacks for a short time. Halo 3 (pictured) has the Bubble Shield. The shield will completely stop bullets, plasma bolts, grenades, rockets and explosions of all sorts. This Beehive Barrier doesn't offer complete protection, however — players and vehicles can pass straight through as if it didn't exist. "Bubble of Death" strategy. Some guy's in a bubble shield? Walk in, drop a spike grenade, and run out. The spike grenade explodes and the effect is a cone of spikes all going in the same direction (shaped charge of spikes). The spikes strike the inside of the shield, and then bounce around inside the bubble, promptly perforating any dumbass still in there. 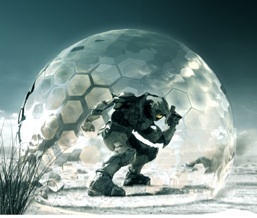 Halo: Reach includes a similar shield with the Drop Shield armor ability, which also incorporates health-restoring properties. In the later games, a beehive-esque energy shield becomes visible whenever a Sentinel is shot. It was turned into a usable item in Playstation All Stars Battle Royale. It prevents interruption and can protect against a Super Attack. Disgaea uses these in the physical and magical barriers. They're everywhere in the Kingdom Hearts games whenever you come across the border of a particular level. There's also the Reflect and Dark Shield spells in KHII, which momentarily create a Beehive Barrier around the user. The former follows up with a burst of magic if an enemy attack actually connects with the barrier, making it one of the most dangerous spells in the game once it's been levelled up. In Kingdom Hearts II Final Mix+ , Aqua creates a barrier around someone else (Terra) in the secret movie. It's also her regular guard ability in Kingdom Hearts: Birth by Sleep, emphasising her Magic Knight / Squishy Wizard status. In Mega Man X 7 and X8, if you shoot an enemy when it isn't vulnerable, bits of Beehive Barrier appear to let you know. Zero also projects one when using one of his weapons (a fan) in the latter. The Inhibitor bloodline of Bloodline Champions has a Rune Shield ability which does this. It reduces damage taken, but the real best part of it is if it takes enough damage, it will end, exploding - which means it damages and stun enemies around the shielded target. Near the end of Skies of Arcadia, a barrier like this is put up around Soltis, forcing the heroes to regroup and try to figure out how to get around the thing. Also, beehive barriers are what "Evasive Action" looks like in ship-to-ship combat. Used in the semi-unreleased game SCARAB, where your Beehive Barrier has to be rotated or your opponent will simply shoot out one of the hexagons, then shoot you through the hole. Additionally, when one of them has been hit and no longer stops incoming fire, it also turns opaque, allowing people to see how damaged the shield is, and preventing the victim from seeing where the fire is coming from. Star Ocean: Till the End of Time had a green Beehive Barrier appear while blocking attacks. Certain enemies in Rogue Galaxy are protected by barriers (until broken by a special gun) which are momentarily visible as Beehive Barriers when struck. And a rainbow colored one when the Protection Spell is cast. In Breath of Fire: Dragon Quarter, a Beehive Barrier indicates bosses with "absolute defense." In the .hack games, Data Bug monsters are covered with green hexagons. Square-Enix's The World Ends with You features Beehive Barriers (simply called "walls") as part of the Reaper's Game. Every day has the Reapers limiting players limited to a given region, and trying to travel to any inaccessible section leads to a characters running into Some Kind of Force Field (occasionally with a cutscene. Some can be lifted, usually by meeting the conditions of a nearby Support Reaper. The Auger in the Resistance series can project one of this as secondary fire, it's an oval wall rather than a full circle as most of them, but the look stays, the Wrath does one as well in Resi 2. As one can tell from Zone of the Enders and Metal Gear Solid 2: Sons of Liberty, Hideo Kojima sees the world in sheets of electrified hexagons. "That is what technology looks like, damn it." In Too Human, named/boss-styled Goblins have a glowing red Beehive Barrier that needs to be knocked down before Baldur can start eating away at their actual HP. Pretty common in Final Fantasy games as well. In Final Fantasy X and Final Fantasy X-2, one will appear if you get physically attacked with the Protect spell active. The White Mage merit spell Shellra V in Final Fantasy XI forms very much like a Beehive Barrier when cast. Eald'narche has a wall of Exoplates surrounding him when you fight him at the end of the Rise of the Zilart expansion, as well. In Final Fantasy Tactics Advance 2, some classes, among them Paladins, have the ability to set up a Guard-buff. This is represented by a hexagonal mark that flashes under the casting of the spell. In Final Fantasy XIII there is a Running Gag where each time Galenth Dysley appears in human form, Snow Villiers runs up and attacks only to be violently thwarted by one of these each time. Time Gates in Final Fantasy XIII-2 also exhibit these when someone they're not meant for tries to enter them, as Snow helpfully demonstrates. Firion's "Shield Bash" ability shows up as an energy beehive shield when he uses it in Dissidia: Final Fantasy. Sephiroth's "Scintilla" produces one too. When you cause a Defense Crushnote This occurs anytime an Armor-Piercing Attack hits a character whose attempting to block it. to your opponent, pieces of a Beehive Barrier can be seen shattering. The moment characters have been Wall Rushed into the invisible barriers of some stages in Dissidia, the section they slam into briefly becomes visible, showing us 7 glowing hexagons. Despite its name, Laguna's Electroshield is a small, spherical Beehive Barrier, not a shield made of electricity. In Final Fantasy XIV the protect spell causes a ring shaped barrier to appear. Portions of it will appear again when you take damage until the spell wears off. In Final Fantasy XV, this appears to be a power of the Kings of Lucis. King Regis uses it to protect the entire Crown City, and the members of the Kingsglaive gain the power to erect them from him. Alas, despite drawing his powers from the same royal bloodline, this power is never extended to the player character, Prince Noctis. In the console Pokémon games, starting from XD: Gale of Darkness, the moves which raise defense take this form. In a more literal sense, Vespiquen's Defend Order. The animation for Aegislash's signature protecting move, "King's Shield," looks like this. In Tales of Symphonia: Dawn of the New World, the Barrier spell and the shield protecting the Garuda monster are Beehive Barriers. In Destiny, Valus Tlu'urn projects one at the end of the Shield Brothers strike. Several rings in zOMG! summon Beehive Barriers. Improbability Sphere summons one around an ally as a general, while Turtle Summons one around yourself as a "OH SHI-!" shield. Some of the wards in The Last Remnant appear with a beehive pattern in front of the target. Several protective spells in Neverwinter Nights 2 look like this. In Mass Effect, one of the abilities creates a single hexagon barrier in a likely homage to this trope. In Mass Effect 2, all the barriers display a beehive shape when first forming: Geth, Collector, Tech Armour, Krogan fortification, you name it. Not biotic barriers, though; they're always smooth surfaces, which makes them more visually distinct from tech-based shields. This continues into Mass Effect 3, with the Leviathan artifact in the DLC of the same name being secured within a cylindrical shape made of hexagons to prevent it from sending out mind control waves. The Age of Jalak Dador in Myst Online: URU Live has a force field you can toggle with your KI, which helps since the thing it protects is a giant stone game board that you're able to adjust to rather staggering heights. In Rez, the third boss (the Venus (Tera) security system) is protected by one of these, and you have to shoot out each individual cell when it flips over to fire its lasers at you. Not surprisingly, Wild Arms 4 and Wild ARMs 5 feature this, given the HEX battle system. In the Wii version of Trauma Center, the bomb from the bomb defusal mission is surrounded by a solid field of hexagonal plates that rotate about the place in 3D. Appears when guarding in Baten Kaitos. The Leviathans in Metroid Prime 3: Corruption protect themselves with glowing blue barriers composed of interlocking hexagons. As does Samus herself with the Hazard Suit upgrade. The A-gear of Ace Online gets one of these ◊, perfect for negating all missile damage for a bit. The tutorial missions begin with a section of Millennium City enclosed by a Beehive barrier by the Qularr aliens. However, the hexagons aren't exactly perfect, and sort of float through the barrier as you watch. Also a partial, shield-shaped Beehive barrier is an optional block power in the Power Armour powerset. In World of Warcraft, this is called Shell Shield, a powerful ability that reduces all damage taken by 50%. This is mitigated by the fact that the only ones who can actually use it are turtles. In Command & Conquer: Red Alert 3, you have the Nanoswarm, which fades away towards the top, but is still present. It functions as a sort of domed room with no exit, with stuff going in but not coming out until it dissipates. Great for waiting out a Soviet nuke Vacuum Implosion device. FEAR 2 has this for Enemy elite Power Armour. Curiously, they player's version is missing this particular feature-which is remedied in the third game. The Protoss immortals from Starcraft II have special hardened shields that take this form to distinguish them from the normal plasma shields. The early development version of Starcraft II had a Protoss air unit called the Tempest which had a special energy shield made of tessellating hexagons. It was stronger than normal shields, but only worked against attacks from ground units. Cover Shield ability for Engineers in Star Trek Online. Not a full sphere, but very hexagonal. Some of the defense grids around planets in missions are of this type as well. Justified in Homeworld Cataclysm, as the protective shells are created by surrounding the core ship with several dozen minute Sentry drones that serve as the apices of the prospective force-field polyhedron. The Class 9 and 10 shields in Freelancer have this effect when the ships using them are attacked. Specifically the shield is normally invisible and is more or less form fitting, but when struck it will become partially visible, revealing tessellated hexagons. In Crysis hexagons are used in several parts of the Nanosuit design. Especially in Armor mode . Super Robot Wars Alpha Gaiden has the AEGIS System, a series of shield satellites set up around the Earth to protect it from the gravity wave unleashed by the death of the Big Bad from the previous game. In this case, the shield is powered by the world's Super Robots from a power station set up on the Moon (intended to be the precursor to Gundam X's Satellite System). MOTHER 3 has this in the form of PK Shield and PK Counter. League of Legends uses this for some shields, such as Morgana's magic-blocking Black Shield or Poppy's unbreachable Diplomatic Immunity. In addition, the summoner spell Fortify (before it was discontinued) used to deploy invulnerable, but short-lived shields of this type around every friendly turret. In Xenoblade, the Monado Shield art briefly creates one around the party when it's used. In Xenoblade Chronicles 2, the ability to generate these is a basic common ability of Blades and Artifices. Malos is also capable of deploying a more distinct and powerful version of it, since he wields a Monado of his own. In Digital Devil Saga, whenever an attack is reflected due to game mechanics, a Beehive Barrier of thousands of tiny tesselated hexagons will briefly flash as the inertia of the blow or the magical energy bounces off it and hits the caster. In I Miss the Sunrise, Ral seems to create large, physical versions of these using raw mechanical materials in the mission where you fight them. They don't actually use it in combat, though. In Borderlands2, Axton's Sabre turret can, if you've taken the right skill, deploy a bubble shield around itself. Players can walk and shoot through it, enemies can't. ION Loader enemies can project a much larger one, though in this case players can walk through it — they'll just get zapped by the loader until dead if they do. Your personal skills have a similar effect. In Ragnarok Online, using the Parry skill as a Lord Knight will trigger a beehive barrier hemisphere special effect that will briefly cover the character. Shields in FTL: Faster Than Light are shown as an oblong shell of hexagons around your ship. The hexagons grow brighter and more pronounced with every layer of shielding gained. In the Facebook game Marvel: Avengers Alliance, various characters use this kind of shield, the most notable being Barrier Warrior Recue, who have three different variations, sphere, half sphere and flat. With the rework of Symmetra in June 2018, her ultimate ability now creates a temporary flat beehive barrier that extends indefinitely. The various high-tech walls in Prismata look like this. TerraTech's late-game Havoc shield generator creates one of these. In Destroy All Humans!, most Furon shields have this pattern. Red vs. Blue: Agents North and South of Project Freelancer use the Halo barriers, once weaponizing it, and North using Theta to open small windows allowing him to fire through the barrier while under full assault. The web comic Mystic Revolution has one, as seen in this strip . Legion of Super-Heroes has Brainiac 5's force field. Futurama: The Earth is shielded by one made of plates of some ridiculously named artificial diamond in The Beast with a Billion Backs. Diamondilium! Which beat out Farnsworth's Diamondium after a game of deathball. Code Lyoko: Aelita uses her power to create a Beehive Barrier (as a curved wall instead of a sphere, though) for the Skidbladnir in "Replika"
Voltron: Legendary Defender: The Castle of Lions shields itself with a dome made of hexagons. Three of the lions were hidden away in similar shields. In Miraculous Ladybug, anyone who wields the Turtle Miraculous can create one of these. So far, the only person who has been seen doing such is Nino Lahiffe, aka Carapace. Literal example: In some parts of Africa, farmers use fences with beehives in order to prevent the elephants from crop-raiding. May be considered a case of art imitating life, since geodesic domes (buckyballs like Spaceship Earth at Disney's Epcot Center, for example) and other hexagon/pentagon based spheres like soccer balls are much stronger the more individual pieces they have. Nothing in video games is truly round, unless some game is using real-time-tessellated shapes such as NURBS, Bezier patches, or Catmull-Clark patches. So it's likely this trope became a stylish way of pretending a barrier was spherical back when tessellation was intractable, but looked cool enough that it stuck. The Eden Project, the world's largest greenhouse, is comprised of several domes built from hexagonal segments. Chobham armour, currently the tank armour used by the US and British, uses ceramic tiles embedded in hardened plates for extra strength. One of the tile shapes used is hexagons, presumably to minimize weak points. NASA heat shielding (or at least that of the Apollo missions) is made of honeycombed metal, each filled with a special plastic to absorb the heat of reentry. Chicken wire used for fencing uses hexagonal mesh to spread pressure more evenly. Hexagon Park, or Bursa stadium . Kikko is a type of feudal Japanese armor similar in concept to European brigandine, but which uses hexagonal plates of iron or hardened leather attached to a cloth backing. Named for the hexagonal plates on a tortoise shell they resemble, it is possible that this led to a more general association between hexagonal grids and lightweight flexible/curved protection.